Saf T Block prevents damage to equipment or personnel and is necessary for a press operator or setup or maintenance personnel to have "HANDS IN DIE," or when someone is working on or in the die or within the press platen area that could cause injury should the press activate. The use of Safety Blocks in die presses is required by the U.S. Occupational Safety Hazard Administration (OSHA) to protect press operators. O.S.H.A. says, "The employer shall provide and enforce the use of safety blocks whenever dies are being adjusted or repaired in the press." Many materials are available for use in blocking the ram and upper die of a press. However, 6061-T6 or T651 aluminum offers much higher extruded strength per cubic inch of material than other known press safety block materials on the market such as magnesium. When static load capacity of material is compared, aluminum becomes the clear choice. 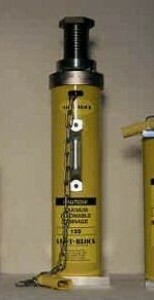 Available in many different capacities and in four sizes | Lengths are available from 4" to 92"
Capacity: 125 ton static load in 1 inch increments. Standard screw adjustability is 5 inches, however, screw adjustment up to 12 inches is available. 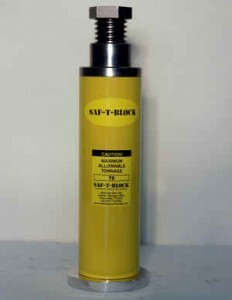 See Standard Safety Block SB-1 for configuration and dimensions. The adjusting screw and nut assembly provides easy adjustment normally both up and down by hand. These screw devices are used instead of wedges on the SB-1 adjustable safety press blocks, allowing for greater span of flexibility. The adjusting screw and nut assembly is mounted securely on top of the safety block at the factory. 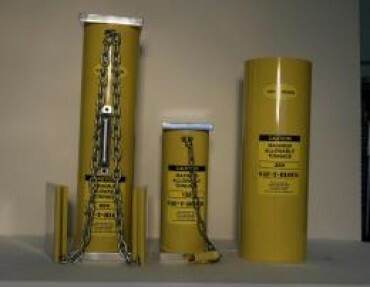 This assembly is used in conjunction with a bottom end cap for additional stability and safety. The assembly allows up to 5 full inches of screw adjustment. 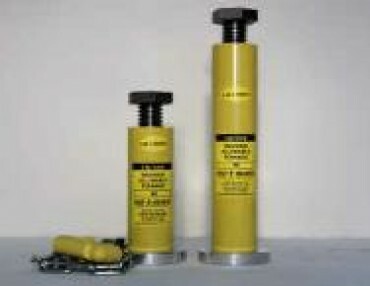 Heavy-Weight adjustable safety blocks are available with handles, holders, and power cut-offs. View options page for details. 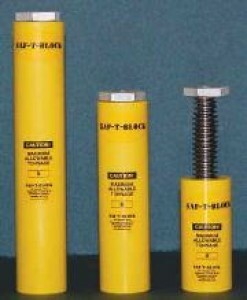 125 ton maximum static load capacity | Safety Block length in 1" increments |Standard screw adjustment is 5"